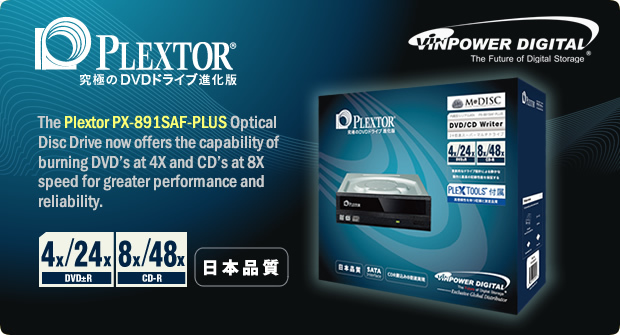 The Plextor PX-891SAF-PLUS Optical Disc Drive now offers the capability of burning DVDâ€™s at 4X and CD’s at 8X speed for greater performance and reliability. Just like the old fable about the tortoise and the hare, sometimes slow and steady wins the race. Often, we only tout how fast a drive is and the max burn speed it can offer. But in reality, the higher the speed, the more likely there could be errors on the copied discs. Those errors could be minor, but to Audiophiles, (a person who is especially interested in high-fidelity sound reproduction), and those that are particular about the quality of their movies and music, those â€œminorâ€ errors are a major problem. Thatâ€™s why those that care about the recorded quality and output of their duplicated discs prefer to use the slowest burn speed possible. The problem is, most of the optical disc drive (ODD) manufacturers removed the preferred 4X DVDÂ±R and 8X CD-R burn speed options in favor of the faster 24X DVD and 48X ~ 52X CD burn speeds, which they can advertise on the box to make people think that faster is better. That makes the users that want to burn at a lower speed, to preserve the quality of their recordings, out of luck. Itâ€™s for that very reason that we helped implement the return of the 4X* DVDÂ±R and 8X* CD-R burn speeds on the new Plextor PX-891SAF-PLUS drive, to satisfy those the rest of the industry has ignored. So if you really care about the quality of your duplicated media and want the option to burn CDâ€™s and DVDâ€™s at the lowest optimal speed, the Plextor PX-891SAF-PLUS drive is the solution for you. 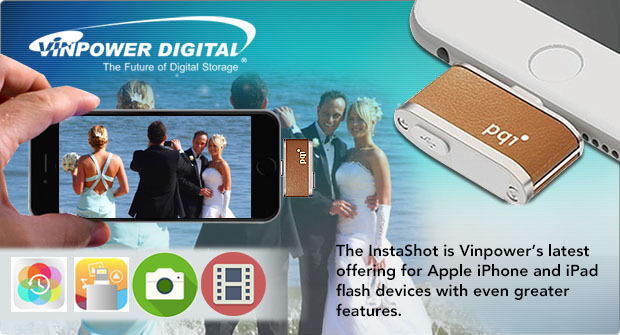 The InstaShot is Vinpower’s latest offering for Apple iPhone and iPad flash devices with even greater features. The latest innovation of flash extension devices for Apple â€œiâ€ products is the InstaShot from PQI, available exclusively through Vinpower Digital. The InstaShot will be available within a month and takes the next evolutionary leap in the convenience and usefulness of flash devices for Apple “i” products in offering live video streaming to the InstaShot without using any memory from the device itâ€™s connected to. Stay tuned for more details and announcements about the official release for this extraordinary product. Smart phones and tablets have become much more than simple methods of communicating or surfing the web. Instead, they have become the Swiss Army Knives of electronics. They have become our cameras, MP3 players, TVâ€™s, navigation, video games, and much more. With all that content, itâ€™s easy to see how the deviceâ€™s internal memory, especially for iPhones and iPads, can fill up quickly. Pictures and videos stored on an iPhone or iPad tend to use the most memory, but itâ€™s not always convenient to back them up onto a computer and storing them in the cloud can be an added monthly or annual expense you donâ€™t need, plus there could be safety concerns with hackers. If you want to make sure you can always have available memory to take any photos or videos you want as well as hold a library of movies, music, documents, etc., Vinpowerâ€™s line of iConnect Mini, iConnect, and the upcoming InstaShot is your answer. All of these devices can quickly back-up all of your stored photos and videos, as well as hold whole collections of movies, music, and other content that would be helpful or entertaining to have available on demand, without using any precious memory from the iPhone or iPad itself. 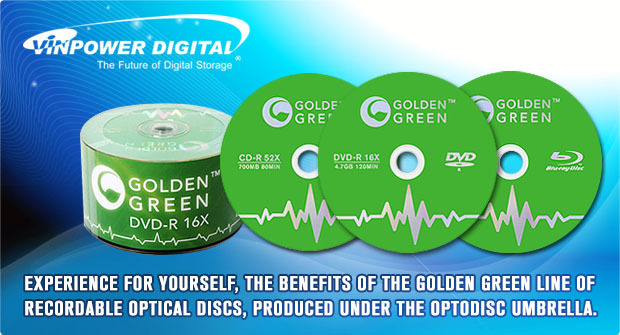 Experience for yourself, the benefits of the Golden Green line of recordable optical discs, produced under the OptoDisc umbrella. There is so much more to discover about Vinpowerâ€™s Golden Green media line, see the benefits for yourself. Because double layer media, like the DVD+R DL find it difficult to accurately burn to the outer edge, most media manufacturers limit the burn capacity to 8.5GB instead of the true capacity of 8.7GB. However, many who use DVD+R DL discs often find that the content they intend to copy is often just slightly larger than 8.5GBâ€™s. This will typically make the duplication process fail and leave the user without an option on how to copy the content due to its slightly larger size. That is why Vinpower developed its line of OptoDisc DVD+R DL media, that with the right duplication equipment, such as Vinpowerâ€™s line of DVD PLUS series of SharkCopier, TITAN, Aero, Cronus, amongst others, that slightly larger content can be copied successfully each and every time. 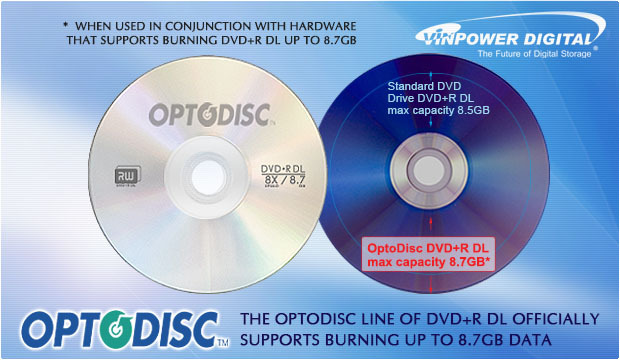 The OptoDisc DVD+R DL allows the user to push past the listed 8.5GB media capacity limitation up to a more than adequate 8.7GB. Even though 200MB may not seem like a significant difference, for those that have a project they need to copy that is even just 5MB larger than 8.5GB, it makes all the difference in the world. With Taiyo Yudenâ€™s exit from the media business, Vinpowerâ€™s line of OptoDisc media has proven to provide a strong and reliable alternative. In fact, Vinpowerâ€™s line of Liquid Defense Plus, the water and scratch resistant glossy media line, which includes CD-R, DVD+/-R, DVD+R DL, 25GB BD-R, and 50GB BD-R DL versions, provides an exceptional print quality that is as good if not better than a full color thermal print. Even better is that the total cost per print for a disc is lower with the Liquid Defense Plus than with a full color thermal printed disc. Around the world, Inkjet printing is still the primary print method for labeling optical discs. Even though the printers can apply photo quality artwork, if the discs are just standard inkjet printable media, the actual printed image is not protected and can easily smear, fade, or bleed. The best way to prevent that is by using the Vinpower line of Liquid Defense Plus media, which uses special nano-particle molecular technology to seal in the ink and prevent moisture or other factors to disrupt the image. As the image shows, the nano-particle molecular technology prevents the ink from separating and holds it in place, regardless of the amount of water or moisture that comes in contact with it. So if you really care about the look and longevity of your printed media, Vinpowerâ€™s Liquid Defense Plus is the best solution for you!